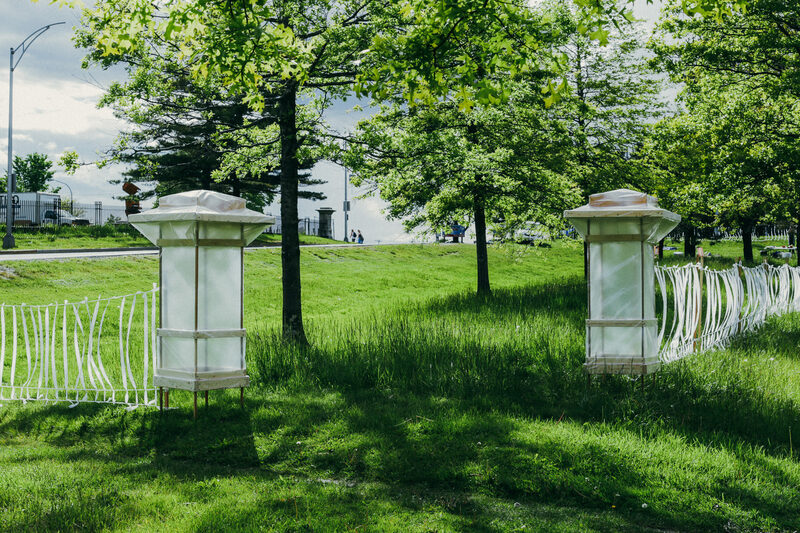 Ghost Fence, a temporary artwork by Portland’s John Sundling, will debut in the Franklin Street median at the corner of Congress and Franklin Streets as part of the First Friday Art Walk on June 3, 2017. It will be the first of three summer projects by Portland artists commissioned by TEMPOart Portland, the non-profit organization dedicated to energizing Portland’s public spaces through temporary art installations. Sundling’s piece utilizes the visual language of surveying and construction, using flagging tape, simple wood poles and plastic sheeting to create a “ghost fence” that outlines the original boundaries of Lincoln Park. In the late 1960’s, the City of Portland razed existing communities to create the Franklin Street Arterial and make the area more “functional” and “modern”. Sundling is interested in this lost physical and social space and wants to “create a simple and effective reminder of both past and present, as well as a place to envision the future.” “My goal is to create an awareness of the past and a place in the present to gather, share stories and create positive memories,” said Sundling. Sundling’s June project will be followed on July 7th by Christina Bechstein’s Now We Plant: Seeds for our American Dream at the Boyd Street Urban Farm, and Christian Prasch’s Wall.., opening August 4th (pending City of Portland Permit) in Post Office Plaza. All three commemorate the one-year anniversary of TEMPOart’s inaugural project, Judith Hoffman’s, The American Dream, the Lincoln Park sculpture that will remain on view through the summer, and each new installation responds to that first sculpture by offering ways to understand the meaning of the “American Dream” today. John Sundling is an artist and designer, working in diverse disciplines including floristry, set design, sculpture, curation and custom fabrication. Recent work includes miniature sets for puppets in a feature film, and co-directing a “no-profit arts disorganization,” the Institute for American Art. His sculptural work has been primarily large-scale, often outdoors, with an emphasis on the effects of time and nature. The artist’s set design work has grown to become more environmental and sculptural in response to this exploration. Sundling is most interested in the blurry edges of his practices and how they inform each other. TEMPOart energizes Portland’s public spaces through temporary art installations – engaging residents and visitors, enriching its creative community and enhancing Portland’s reputation as a world-class city. We provide opportunities for artists to experiment with new mediums, highlight current issues and engage a wide public audience. We partner with other on-profit educational and cultural institutions, using each project to inspire innovative learning opportunities for all ages. TEMPOart is a privately-funded 501-c3 non-profit organization and is administered by a Board of Directors.